Everyone knows that electricity travels along the wires we see along streets and across fields and over the countryside. It seems pretty simple: electricity magically jumps onto the wires and just arrives at your house, ready to power your big screen TV. 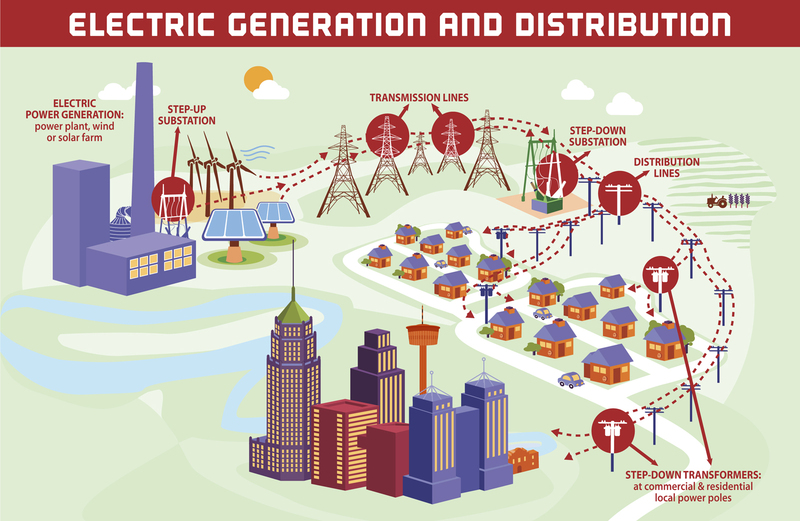 Of course, you know it’s not really magic, and in this, our second post in our series that aims to make the very complicated energy business more understandable, I take on transmission and distribution: how electricity generated at plants moves to homes and businesses. For starters, the fact that it looks so simple means a whole lot of really smart people have done a really good job. But it’s way more complicated than most people can even begin to grasp. Electricity is a use-it-or-lose-it proposition; there’s currently no utility-scale storage option. So as soon as it’s generated, it goes on the lines. How much is generated and put on the lines is determined by system operators, as we learned in my first post in the series. Electricity generated at the power plant goes through a transformer to change the intensity while it is on the transmission system. For example, electricity is “concentrated” or transformed to a higher level voltage before it goes onto the transmission lines. That’s because transmission lines carry a whole lot of electricity over a very long distance on very big wires. When the electricity gets to a substation, another transformer reduces the voltage – or intensity – of the electricity down to levels suited to travelling along the power lines you see in the distribution system around the city. Then, before the electricity goes into your home, there’s one more transformer it goes through to bring the voltage down to the standard household level of 120 volts. The distribution system begins as the electricity leaves the substation and ends at each customer’s meter. Each wire pathway from the substation is a circuit. Distribution circuits serve many hundreds or thousands of customers. Wires for distribution may be carried on overhead pole lines, or buried underground. Transformers can be pole-mounted or on concrete pads. A pole mount transformer may serve only one customer, but in more built-up areas multiple customers may be connected with three to five residences per transformer. This is grossly oversimplified — I’ve left out much of the technical explanations that engineers discuss as easily as you and I talk about the weather. Besides, what’s really interesting is all the stuff that happens to build the system and keep it going. A single wooden pole costs more than $500, and a standard pole-mounted 25kVA transformer — the thing that looks like a cylindrical can — costs more than $800, and a 50 kVA transformer – the big green boxes you see in neighborhoods – are almost $2,000. CPS Energy has more than 350,000 poles and 175,000 transformers in the system. Do the math. That’s a huge amount of money required just to keep the electricity flowing. Now let’s look at a substation. With ALL the equipment included, a typical substation costs about $9.5 million million to build, and millions more to maintain over its lifetime. Transmission lines can cost as much as $2 million per mile to build. And yes, the utility – in our case, CPS Energy – is responsible for building and maintaining transmission lines within its service territory. Most importantly, though, are the people that work on the system – the people that design it and build it, and the people that maintain it and fix it when it goes down. First, the designers. Folks in the transmission planning and distribution planning departments have the job of identifying where new or additional power will be needed in the future. They look at area growth trends, new development, new technologies and consumer purchases (like flat screen TVs, multiple smart phones, etc), and economic forecasts to predict where more electricity will be needed. Once they recommend an area where a new substation is needed, finding a site is the next challenge. Next they determine the route for the connecting wires. Site selection and routing can take months, sometimes years. Once that’s done, the engineers use all their engineering smarts to design the most reliable, efficient distribution system possible. Then there’s the people who actually build, maintain, and repair the lines. Talk about guts. Power line installation is the 11th most dangerous job, according to the Bureau of Labor Statistics. Electricity can be lethal, plain and simple. The risk of injury and death would like likely be higher without the industry’s rigorous safety training and specially designed equipment and protective wear. At CPS Energy, safety is our number one priority. CPS Energy has almost 800 field workers who are on the job 24/7/365. When outages occur, it’s people that fix the problem. Outages occur throughout the year, most caused by – surprise – squirrels. The people that fix these problems are pros, for sure, and they are my heroes. You may see multiple workers at a site with several appearing to stand around doing nothing and think we’re wasting money. Wrong. OSHA (the Occupational Safety and Health Administration) requires spotters on site to have extra eyes on safety factors. So what looks like goofing off to you is actually us making sure that everyone goes home safely – and we’re complying with the law. While the technical aspects of the electric system are absolutely fascinating, there’s a whole lot more to the power at your fingertips than just the technology and the wires. Special thanks to Dwain Duke.